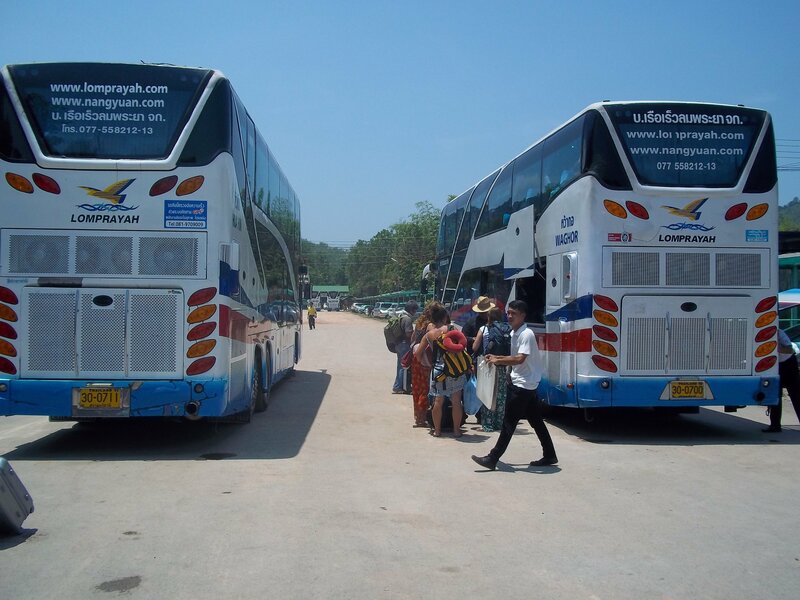 The only way to travel direct from Chumphon to Phuket is by bus. There are no direct flights from Chumphon to Phuket and Phuket is not currently connected to the Thai railway network. 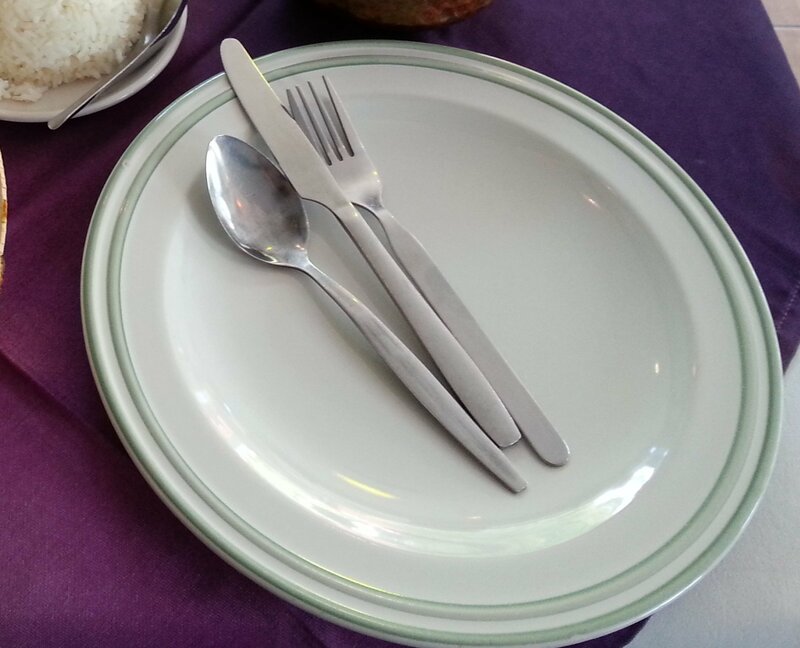 The other options than taking a bus all the way are to take a train from Chumphon to Surat Thani and then take a minivan from Surat Thani to Phuket, which reduces the time spent travelling by road by 50%, or alternatively to fly from Chumphon to Bangkok and then fly from Bangkok to Phuket. There are 7 direct bus services a day from Chumphon to Phuket which you can book online. The journey time from Chumphon to Phuket with Fame Tour is 8 hours 00 minutes. The journey time from Chumphon to Phuket with the Rung Kit bus company is 8 hours 40 minutes. Use the Search Box below to book your tickets from Chumphon to Phuket. Fame Tour services from Chumphon terminate at Phuket Bus Terminal (1) on the Phang Nga Road in Phuket Town. Rung Kit services from Chumphon terminate at Phuket Bus Terminal 2 located on the Thepkrasattri Road, which runs north from Phuket Town. 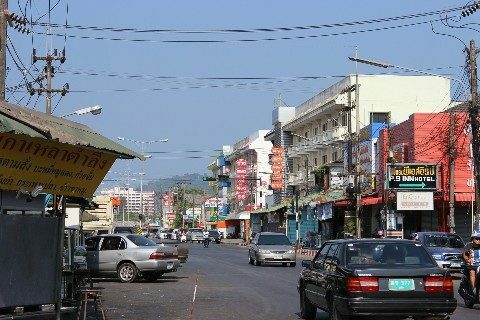 Taxis are expensive in Phuket and the cheapest ways to travel around Phuket to popular destinations such as Patong Beach and Kata Beach is to travel by shared songthaew taxi or by public minivan. A shared songthaew taxi is a converted pick up truck with two rows of seats under a metal cover. Songthaew taxi run on fixed popular routes and passengers flag them down roadside and then push a button in the roof of the cab to indicate when they want to stop. For local Thai people the price of songthaew taxis is fixed and very cheap, as foreign visitor you will need to agree a price before you start your journey. 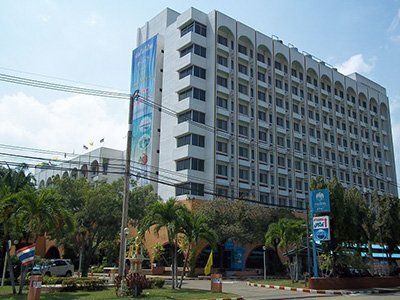 There are frequent public minivans and songthaew taxis running from Phuket Bus Terminal (1), which is the final destination for the Fame Tour service from Chumphon. Bus tickets on the Fame Tour service are more expensive but the destination is a lot more convenient. Rung Kit bus services terminate at Phuket Bus Terminal (2) which is 4.8 km away from Phuket Bus Terminal (1). Unless you travel by taxi, you cannot travel direct from Phuket Bus Terminal (2) to local destinations in Phuket. The cheapest way to travel from Phuket Bus Terminal (2) to any of the beach towns such as Patong is to take the inexpensive purple songthaew service which runs between Phuket Bus Terminal (2) and Phuket Bus Terminal (1) and from there take a minivan or songthaew taxi to your final destination.